Home / Automotive / Cars / Techrules Ren Rs Supercar Revealed – And It Has Turbines! What's got six electric motors, two turbines, one seat and delivers a 960kW kick in the pants? This new beast from Beijing. 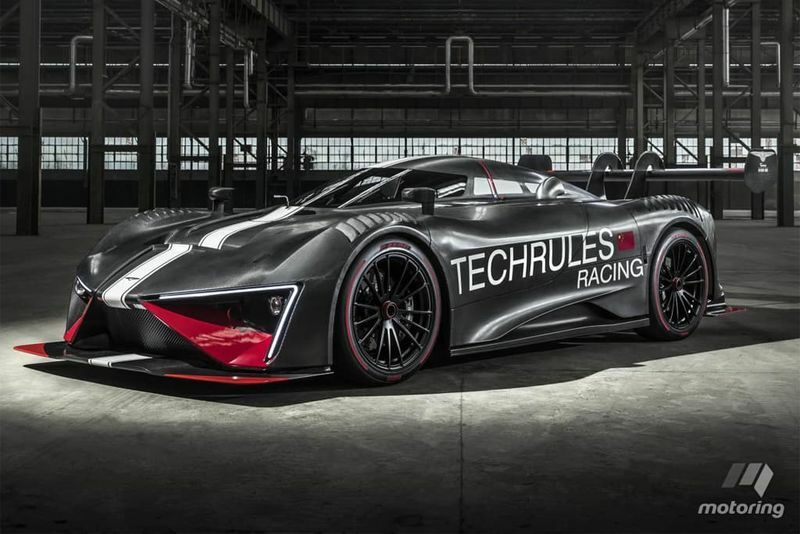 Forget hydrogen, four-stroke, compression-ignition petrol engines or even hybrids, because the Techrules Ren RS supercar brings a new paradigm to car propulsion – twin-turbine power! The Techrules Ren RS uses patented TREV technology (turbine-recharging electric vehicle) that effectively creates a very efficient and powerful range-extending system. First seen on the innovative and road-legal Techrules Ren supercar in 2017, the car’s electric motors pound out an ungodly 960kW (1287hp) of power and 2340Nm of torque. To put that in perspective, the Bugatti Chiron‘s 8.0-litre, 16-cylinder, quad turbo petrol engine is good for 1600Nm. To its credit, however, the Bugatti can still claim to be the world’s most powerful production car, with a 1103kW peak power output. The Techrules Ren RS is an extreme single-seat version of the brand’s supercar show last year. Designed solely for racetrack use, this extreme machine has a range of 1170km, enough for several laps around the Nurburgring. That’s because the 1854kg track weapon has an 80-litre diesel fuel bladder, which feeds the turbines, providing a range-extending capability. The turbines drive a generator that charges a 28kWh Lithium-ion polymer battery pack. The battery then runs a pair of electric motors driving the front wheels and a quartet of electric motors for the rear wheels. Combined, this sextet of motors blasts the Chinese supercar from 0-100km/h in 3.0 seconds flat. Top speed? An eye-watering 330km/h or 205mph. Most turbines operate at very high revolutions per minute, this one expected to do around 100,000rpm, and can therefore burn fuel very quickly and with very high exhaust temperatures (slipstreaming this car could be interesting!). The technology is similar to the jet engines of commercial and military aircraft. The bodywork is wrought in a way that provides sound aerodynamics and downforce; the huge lip spoiler is designed to keep the front end stuck to the race track as airflow is directed around the car and into various vents, intakes and radiators to aid cooling. The rear end features turbine exhaust vents and a large diffuser to smooth the airflow exiting under the vehicle. There’s also a massive adjustable rear wing that ramps up downforce over the rear axle for more grip, or can reduce downforce for higher top speeds. Deceleration is controlled by AP Racing carbon-ceramic rotors and 380mm six-piston brake callipers up front, 355mm four-piston callipers at the rear. Based on a stiff carbon-fibre tub, the Techrules Ren RS is designed to withstand high-impact collisions that occur on racetracks. The twin turbine, six-motor setup is the most extreme combo available from Techrules, but potential buyers can get less extreme versions with just a single turbine and four electric motors (640kW/1560Nm). Wuzhoulong Motors is expected to use the TREV technology in its EV busses in China as well so even if Techrules automobile efforts fail to result in sales, the turbine technology may live on.